One grey day in the frozen depths of winter, I saw a flash of gold in the woods behind our place: fox! It moved with a wonderful fluidity and sense of purpose, but wary and close to the ground. Later, my husband thought he saw it again —disappearing down the old woodchuck hole in the underbrush — but then months went by without another sighting. We consider foxes a blessing. Whenever they’re on our property, the woodchuck population drops precipitously. Whether the foxes eat them — or just scare them off — it’s hard to say. But we do know they tend to repurpose the woodchuck burrows for their own dens. It was heartening to see one apparently scouting out a new home in a known woodchuck neighborhood. My heart sank in mid-April when I spotted a woodchuck waddling in a proprietary way along the border garden. Sure enough, the next morning, my early tulip shoots had been gnawed down to nubs. I planted the pansies anyway, resigned to the fact that the woodchucks would consider the freshly filled urn their own personal snack bowl. So I was surprised when the pansies were left untouched for a whole week … then another. 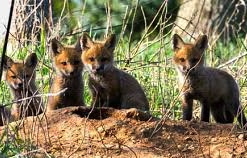 This past weekend we discovered why: four fox kits gamboling in the sunshine not far from the woodchuck hole that had clearly become their den. Then we saw the vixen, standing on alert nearby. When she spotted us, she barked — yip, yip, yip, yip — as if counting her young, and they all tumbled back into their hole. Here’s a poem about foxes which I think beautifully captures their solitary natures. bleached street-lit things, I’m best at moving on. of something missed, flash-pop or empty frame. I’m always coming back. I chew through traps. I love whatever doesn’t get too close. I wasn’t able to get close enough to the fox and kits to take photos without scaring them. I “borrowed” these shots from the internet. The shot of the kits, especially, is remarkably close to what I see through my binoculars. We used to see some foxes at our house in nearby Red Rock NY that we sold. I was always impressed by their intelligence. I remember a few times a fox and I would just look at each other, taking each other’s measure in a leisurely sort of way. The fox would let me get fairly close to it, and unlike most animals, seemed to know when I got too close. Also I noticed that you never see a fox hit by a car there–another sign of their canny ways. Those kits are very cute! Such an interesting point that you never see foxes hit by cars. One the other hand, there are woodchucks galore! Coyotes in Riverside Park, Battery Park City, Queens…and foxes up by you…doggy blessings in abundance. 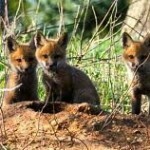 If you do manage a photo of that fox or any of the little ones, please post it! Thanks, Leslie, I’ll try to get a little closer, but they have a way of disappearing into the green! My husband and I live in Promised Land, Pa. We are surrounded by state game lands and two beautiful lakes! The larger lake has a road that winds around it’s perimeter and on that road is where we saw 3 kits and mama. One ran to her, the second to a dugout close by and the third posed. I managed to get a picture of the modeling kit, but we had to leave because “papa” was bringing in dinner! What a wonderful experience to see them! Promised Land sounds a little bit like Paradise. It would be great if you could send the photo of the “poser”! I agree to see one makes you feel lucky, almost like we really are the intruders. Once when I was 8 months pregnant and we were at Montauk Point. We came upon a family staring at us as they crossed the street (we were in the car). My husband and I got out to get a closer look. I recall they startled and it felt like they were moving towards us. My husband ran and I waddled slowly back to the car. I never let him live that down! I won’t let him live it down, either! I used to see one in the early mornings (around 5 a.m.) strolling about our suburban neighborhood in Miami. It would bark every time it saw me. Funny little bark. One afternoon we caught the same gray fox sunning on our pool patio. It’s been a couple of years since the last sighting and I suspect some neighbor called animal control to take it away. My brother used to live in Coral Gables and would see them frequently. Such a wonderful sight, but it must be so startling in a suburban setting. I love the image of the fox taking a break by your pool!